Sky continues to record Liljana and Paul on her camcorder, barely believing what she is seeing. Boyd goes over to Janae to play some basketball later. Just then, Sky comes in and Serena asks if she can borrow the video camera to film the demonstration, but Sky says she needs it for her media project. She can barely look at Serena. Sky goes over to Boyd and tells him in some agitation that she needs to talk to him now and drags him off. Sky shows Boyd the video footage of Liljana and Paul kissing and Boyd tells her firmly to tell noone. Dylan comes round and he is suspicious of Boyd and Sky being together alone, but agrees to meet Sky later. Liljana is leaving a message on David's answering machine saying that she has something important to talk to him about. When she hangs up, Susan tells her that she's doing the right thing. Liljana worries that David will be very hurt, but Susan says it's better he finds out from her that from someone else. Susan asks Liljana if David would get violent. She says he wouldn't with her, but he might with Paul. Boyd still thinks talking to Liljana is the best thing and Sky says he's right. She goes off to talk to her, but leaves the video camera behind on the living room chair. Susan answers the door to Sky. She asks to talk to her privately, so Susan goes into the garden. Sky tells Liljana that she saw her kissing Paul and knows she's having an affair. LILJANA: Oh, Sky, I'm so sorry. SKY: Oh, Lil, how could you! (starts to cry) I've looked up to you my whole life. You're the closest thing I've ever had to a mother since I was little. And you get sucked in by a slimy conman like him? SKY: Is this why you left Uncle David? You've been having an affair all along. Liljana says they kept it to themselves because an affair isn't easy to accept, but she's already decided to tell David and Serena that afternoon. She says she fell in love with Paul - it's not easy but it's the truth. Lil tells Sky that it's important that David and Serena hear the news from her, and begs her not to say anything until she's had a chance to break it to them. Dylan is moaning to Janae that Sky is hanging out with Boyd and Janae isn't too happy about the situation either! Janae starts having a go at Sky, but Dylan defends her. Janae walks off. 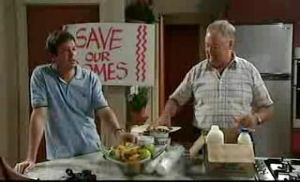 Harold, David and Serena are talking about the protest. David doesn't think they can make a difference against a huge company, but Harold compares the situation to Gandhi - a small man who brought down the Raj with a simple hunger-strike. He says David always gets cold feet at the eleventh hour, but they've got right on their side and they'll win. Serena picks up the camera and says she'll take photos of the demonstration. SERENA: Who knows? The photos on the camera might change the world! 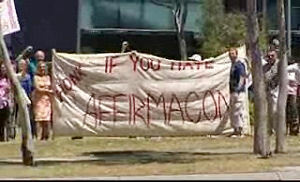 Everyone is demonstrating with placard - "Affirmacon Out!" Sky and Dylan come in. Dylan wants to know what she and Boyd were talking about but Sky is distracted because she can't find her camera. She starts to panic. Susan is handing out drinks and photographers are taking photographs of the proceedings. Dylan is trying to talk to Sky about their relationship(!) but he could hardly have picked a worse time - Sky is frantic about her camera. She realises that Serena must have taken it to the protest. When Sky drags Dylan off to look for the camera, Janae sneaks in through the back door. Susan asks David if he's had Lil's message about meeting him later. He hasn't checked his messages, so goes off to look for his phone. Harold says he's proud of Susan for supporting the cause, even though she's moving away. Harold asks Susan why she's moving to Shepparton anyway. She can't think of a reason off the top of her head so Harold asks her if she's having a change of heart. David comes back having checked his messages and is pleased that Lil wants to meet him. Harold gives him the camera and tells him to take some shots of Serena in action. Paul gets out of his car. He's on the phone to Lil - she tells him that Sky knows about them and he should be careful if he runs into her. Dylan's car comes into view in the background. David tells Serena that he's got some good shots of her. They start to review the shots together. Dylan and Sky approach the demonstration and Sky races out of the car. Paul intercepts her and tells her she knows she doesn't like him, but it's no reason to take it out on her aunt. Sky fends him off and races over to David and Serena. But it's too late - they've seen the photo of Lil kissing Paul. David's face is stony. Harold tries to tell David to calm down, but he's seen Paul in the crowd and is blinded by rage. He quietens the crowd. DAVID: That man there is Paul Robinson. Liar and cheat. Now when I first said that, people laughed at me, told me I was nuts, but now I've got proof. That everything I said was true. He is corrupt from head to toe! DAVID: No Dad, no! Not this time! He's stolen my trust, he's stolen my good name and now he's stolen my wife. And here's the evidence ladies and gentlemen! Do not trust this man! Not with your homes, not with your futures, and certainly not with your wives and kids! David stalks off leaving Sky to pick up the mantle. SKY: Uncle David's right. You're a liar and a thief. She and Harold walk away. Paul catches Dylan's eye in the crowd, but he too looks disgusted. Janae has made a right mess of the house. Boyd comes round to visit and she becomes very edgy. She hides some things under the washing basket. Boyd comments Sky likes the music that is playing too. It is becoming clear that Janae is trying to make herself more like Sky so Boyd will like her. They go into the kitchen and Boyd says he doesn't like the music - he's more into the Top 40. Janae says she doesn't like it either and goes to switch it off. Suddenly Boyd sees Sky's belongings under the washing basket and Janae says Sky lent her the things. But suddenly she starts ranting that Sky is perfect and Boyd only hangs out with her because he feels sorry for her. Boyd realises what Janae has been doing (trying to make herself more like Sky) and she is embarrassed. She storms out, but Boyd follows her. Boyd says that things will never work between them - for one thing, she just stole his ex-girlfriend's stuff and he thinks that's pretty weird. Janae accuses Boyd of thinking she's trailer trash. She gives him Sky's stuff but he says she'll have to take it back herself. He teases her about her behaviour and she tells him to rack off. Boyd laughs to himself. Lil looks devastated and sits silently. David and Serena come in. DAVID: I bet you are. Susan suggests to Serena that they go for a walk, but David says Liljana can talk to them together - they're a family, or they were. Susan is firm though - she says Serena doesn't need to hear the conversation and takes her outside. LILJANA: I didn't say that. DAVID: That's what you made me believe. How could you Lil? With that scumbag? He set me up, he got me arrested. How could you be with a man like that? How could you bear to let him touch you? 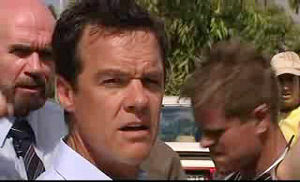 Paul and Dylan are talking - Paul is worried that David will hurt Liljana. Dylan calms him down and says that David is a wuss - he won't do anything. He says Liljana will ring if there's a problem. Paul says he stuffed up. Dylan didn't know that Paul cared about stuff like love and Paul says neither did he. DYLAN: She goes back to her family, everyone happy, problem solved. PAUL: She goes back to David Bishop over my dead body! DYLAN: No chick's worth it. PAUL: They're all words, Dylan. I'm sorry. David asks Liljana when she decided she wanted Paul - before or after he decided to destroy him. Liljana is crying and says it happened gradually. David says she's always valued family over success and money, so it's ironic that she's dumped an honest, hardworking, loving husband for a man who'd happily sell his grandmother if there was a profit in it. David asks Lil when she stopped loving him. She says she wasn't with Paul until after they separated if that is any comfort to him. Through tears she tells him that she's so sorry. David sits down at the table with her. DAVID: I took you in and loved you when noone else would. Your community, your own mother would have nothing to do with you, and I rescued you, remember? - from a hopeless situation. I gave you everything. A home, a child, my love, my entire life, and you've chucked it all away for the most despicable man I know. What sort of woman does that, Lil, what sort of wife? What sort of mother? See I've tried to be fair to you about Serena, but not anymore. You don't deserve the respect of your own daughter. You're not worth it. You're not worth it. David comes out of Susan's house and takes Serena by the arm. He marches her across the street to the Bishops. Sky and Boyd have seen this and she says she'd better give them a bit of time, so Boyd invites her to his house. They put an arm around each other, but just then, Dylan pulls up in his car. He runs up to Sky and tells her he has to tell her something - he tells Boyd to get lost. Sky says she'll talk to Boyd later so he leaves Sky and Dylan to it. Dylan tells Sky that he could have loads of chicks, but he doesn't want them, he's ready for commitment with her. Sky asks if she gets any say in it(!) but Dylan says it's the real thing - he loves her. He wants them to give it a go - he wants Sky to be his girlfriend and the chance to love her.